When the weather gets nice, everyone likes to go outside to enjoy the sunshine and flowers! But when you’re outside, nothing disturbs the peace quite like the familiar sound of very loud buzzing. When you see a big yellow and black bug coming towards you, a common reaction is to run and get out of its way! No one likes dealing with yellow jackets. Cleverly disguised with the coloring of bees, the yellow jacket is a wasp that is known to aggressively defend their nests and dole out nasty stings to anyone in the way. Yellow Jackets are part of the vespula species, which is known for being social wasps. Unlike bees, who like to make their nests in trees, yellow jackets prefer subterranean locations for their nests. Places like tree stumps and fallen logs are ideal situations for them. They’re also known to make nests in human dwellings, such as crawl spaces, attics, and exterior surfaces of buildings! Their nests are constructed by a paper substance they make out of wood fiber and saliva, and can host over 100 inhabitants. 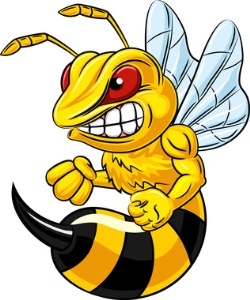 Yellow jackets can sting multiple times without dying, so if you get stung once, don’t swat and just run! Their sting can leave behind a chemical that marks you as an enemy of the nest, which can incite a bigger attack. While their stings are painful, they’re only dangerous to those who have a preexisting allergy. Symptoms of an allergic reaction include difficulty breathing or speaking, swelling of the mouth or throat, wheezing, hives or rash, and tightness in the chest. The life cycle of the yellow jacket revolves around the queen of the hive. In the spring time, a queen will begin the natal nest by constructing a small comb envelope for her to deposit her larvae. Once the workers hatch, they’ll take over all of the non-reproductive duties of the colony. In the late summer, the workers will construct areas for new queens to develop and mate, and abandon the nests forever; once a nest has been vacated, the yellow jackets will not return. Before the summer heat ends, the new queens will go into hibernation in subterranean spaces, like logs and soil, and will only come out in the spring. The rest of the colony, including the old queen, dies with the season change. The Yellow Jacket is a carnivorous insects, and feed off of other insects to provide protein for their larvae. When their food source population starts to diminish, yellow jackets will revert to scavenging garbage cans and any open food. While this helps keep the garden pest population down, their aggressive nature can quickly turn to humans. They are easily provoked by things like the sound and vibration of a lawn mower; they are attracted to sugary substances like soda, and can perceive a threat from great distances.